Renault has taken the wraps of the all-new fourth generation Clio, ahead of its first public appearance at the Paris Motor Show in September. The new model will go on sale in 2013 and you can expect prices to start at around £10,000. The styling is a radical departure from the old model and is based on the DeZir concept car. The Clio will only be offered with five doors, but the coupe-like roofline and hidden rear door handles mean it looks a lot like a three-door. The new model is wider, lower and longer than the outgoing car, so it should be more spacious and more stable on the road. The cabin has been given the same treatment as the exterior, with a more interesting and modern looking dashboard, instrument cluster and centre stack than the drab third generation Clio. Buyers who choose Dynamique trim level or higher will get a new seven-inch touchscreen ‘R-Link’ system, featuring sat nav, entertainment and a host of apps, which make everything from finding a fuel station to sending a tweet possible in car. 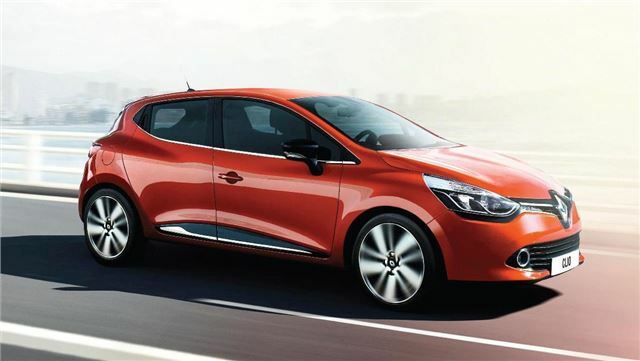 The new car will come with smaller, cleaner engines, including a 900cc three-cylinder petrol engine with 90PS. Fuel economy is expected to be 65.7mpg on the combined cycle, with 99g/km CO2 making it congestion charge exempt and free to tax. There will also be a 120PS 1.2-litre engine, which is linked to a dual-clutch automatic as standard. Finally, a 1.5-litre diesel with 90PS will be available, offering the lowest fuel consumption in the range at 88mpg. That means CO2 emissions of just 83g/km. Regardless of engine, the new Clio will encourage fuel efficient driving thanks to an ECO mode, a driving style monitor, a gear change indicator and even an app designed to coach drivers into reducing fuel consumption. Customisation is an important part of the new Clio and buyers will be able to specify the colour scheme of everything from the grille to the door pulls, as well as interior upholstery and a selection of affordable accessory packs. Eight base colours will be available from launch, including the vibrant red shown in these pictures. The new model will be built in France and Turkey. More details about trim levels, equipment grades and pricing will be available in September. First UK deliveries are expected in early 2013. WILL THE SEMI AUTOMATIC GEARBOX BE MORE RELIABLE THAN THE ONES FITTED UP TO NOW ??. Yes, no, maybe. Pick one.